Yesterday, we received a late-day heads-up from a reader that there was an issue brewing with the pedicabs that offer rides to tourists and residents along the National Mall. The entire issue seemed odd, as pedicabs have been operating on the Mall for a couple years now and haven’t had any issues up until yesterday, when they were told they would be arrested and their bikes impounded for soliciting and servicing customers on Madison and Jefferson streets, the two main boundary avenues of the Mall. If the Park Police was correct, the Mall was going to lose a 100% eco-friendly form of transportation that serves hundreds of riders each week. The cabs provide jobs for the area and a friendly ‘green’ option for people to utilize. Taking away the Mall from them would kill a sizeable portion of the pedicab business. So I set out to contact Ben Morris, the owner of National Pedicabs (and the company affected by this), and his DC operations manager, Danny Cochrane, as well as Sgt. David Schlosser, the National Park Service’s Public Information Officer, to find out just what the heck was going on. It seems it all started on Monday, where two drivers on Madison around noon, were approached by a Park Police (PP) officer. The officer, upon finding out what the two drivers were doing – waiting for riders – told them “you can’t be down here getting rides” and informed them that even though the drivers worked for free, just tips, they were soliciting business, something not allowed along the Mall. The officer then told them they could not ride on the streets, only the gravel of the mall and the sidewalk boundaries, and that as soon as they started talking with someone about their business, it was soliciting and therefore, illegal. The PP then mentioned he was about to arrest a panhandler the next time he received change, so the drivers took that to mean they’d better follow the PP’s directive or risk being arrested. About ten minutes later, farther down Madison, another pedicab driver had a flat and was awaiting a maintenance kit when he was also approached by a PP officer and told to leave Madison. The officer mentioned he’d gotten some complaints about peddlers and they were thus driving off all panhandlers from the Mall, including pedicabs. When questioned by the driver, the officer responded that the pedicab could drive on the sidewalk but as soon as they rang their bell or talked to someone about rides, they were soliciting. The PP then told the driver to inform his (the driver’s) boss that starting tomorrow – Tuesday – he would begin arresting drivers on Madison and Jefferson. 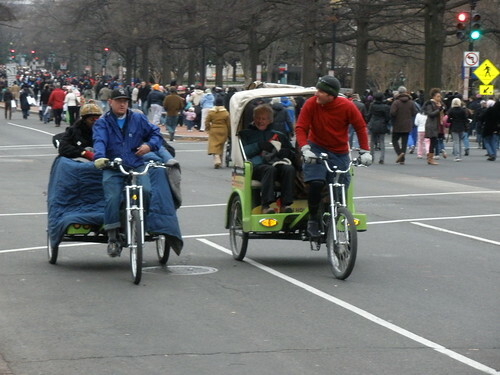 It is the understanding of the park that pedicabs, or bicycle rickshaws, are for-hire non-interpretive transportation services which will operate in the downtown District of Columbia area. A pedicab, therefore, would be subject to park rules and regulations as established for commercial taxicab operations, and as such will not be permitted to operate on park sidewalks or trails. All commercial vehicles are restricted to park roads and taxicab parking is restricted to several designated areas throughout the park as outlined in the attached excerpt from the National Mall & Memorial Parks Compendium. Note that the Superintendent mentions that pedicabs cannot operate on park sidewalks or trails, contrary to what the PP officer told the drivers this past week. Taxicabs, which include all non-interpretive vehicles for hire, such as pedi-cabs or bicycle rickshaws, are subject to the operational limitations at 36 C.F.R. 7.96(f)(3). They are also restricted to park roads and may not operate on park sidewalks or multi-use trails. Sgt. Schlosser agreed, citing the same statue in my request to him regarding the situation, and noted that the regulation is available in many online sources and libraries. So it’s not some obscure regulation, but out in the public view. So this begs the question then, what exactly was the PP officer referring to then? The guys at National Pedicab don’t believe they’re breaking any other ordinances. As they understand it, vendors on the Mall need a special license to exchange money, but because the pedicabs are technically free (just tips), they believe they are not affected by it. However, Danny mentioned that after the incident on Monday, he has since inquired if they do indeed need a license or permit; so far, their calls to the Permit department at the Park Police have yet to be returned. Sgt. Schlosser did say that as of today, there have been no arrests nor impoundment of pedicabs particular to this regulation. We here at WeLoveDC really hope this is simply the case of an enthusiastic but misinformed PP officer, and that the pedicabs will resume business on the National Mall. I cannot believe that the NPS is willing to shut down a business that is 100% eco-friendly, employs over 45 jobs to District residents, and provides a viable and valuable source of transportation to visitors and locals that is frankly, unique and interesting to enjoy after a long day of walking. I’ve asked Ben, Danny and Sgt. Schlosser to keep us informed; here’s to hoping for a positive outcome and that these great area conveyances return to the National Mall for all to enjoy. This entry was posted in: News, Talkin' Transit, The Features, The Mall, We Green DC, WTF?! Overeager Park Police intimidating law-abiding citizens? Why, I’ve never* heard of such a thing! I didn’t know they only worked for tips… for all that hard work, I’d pay them the same, if not more, than a taxicab. Boo on the PP. Overall I think they should be allowed to continue to operate. HOWEVER, I think there’s some cognative dissonance here. As they understand it, vendors on the Mall need a special license to exchange money, but because the pedicabs are technically free (just tips), they believe they are not affected by it. You can’t have it both ways. If you’re exchanging money for a service you’re operating a business. and apparently Ben Morris agrees that they are a business and providing a service. I think it’s a little disingenuous to say it’s “free” since that service would not continue if nobody paid for it. I think they also need to accept that if they choose to live by the sword they’ll die by the sword. If they’re just accepting tips independent of the service – and they say the service is free – they they are, in fact, panhandling. I’m not comfortable banning that – as little as I like being harassed for “spare” change – because then you opt out street performers and the like too, which I think are perfectly okay. But if you say I don’t have to follow rule X because we’re just asking for donations then you have to live by rule Y which bans asking for donations. 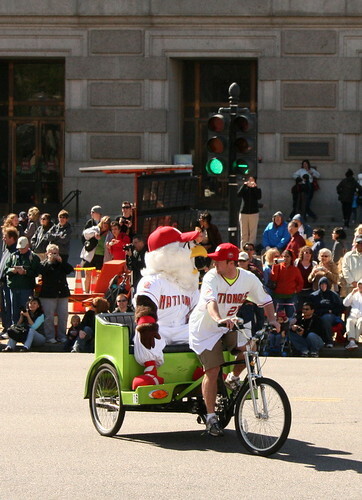 I have taken the Pedicabs many times both in Boston and Wash DC. They have clean cut young men and are a pleasure to ride on. 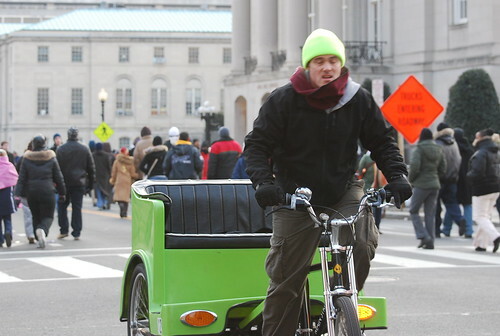 Don’t forget that Mayor Fenty declared the pedicab to be the official vehicle of the Presidential inauguration. Times change quickly. It seems silly for the nation’s capital who should be at the forefront of the green movement to “hassle” what is arguably one of the best modes of transportation in many cities, not just DC. For the police to single out pedicabs, of all things, just makes no sense. I can’t speak to the legal issues or agreements in place, but as a bike rider who frequently goes through Madison and Jefferson all the time, I can see how the Tourmobile people would be upset. Not because of stealing business or whatever the reason given, but because the pedicabs jam up the street. Especially north of the mall, where there is only one thru lane. I don’t have any problems with pedicabs taking over the world, as long as the flow of traffic can continue at speed. Sometimes with all the pedicabs running around the mall, I’m not sure that’s the case. Chris are you joking. I ride around the Mall all the time. Both Madison and Jefferson are only 15 mph streets. The pedicabs I see are passing the many tour buses, cabs, and cars because of all the ped. crossing the streets and cars trying to find a parking space.If anything is clogging up the roads its the many buses sitting running their engines for no aparent reason. If the PP want to enforce something make those buses shut off their engines. Gotta agree with comment 8, to an extent anyway. No idea on the pedicabs, but the buses are EVERYWHERE, and oftentimes block traffic almost completely. If DC really wants to create new regulations for the mall, those should be the first place to start. I have a warm place in my heart for pedicab drivers. Don made the point that I had: that you can’t have it both ways. You either are a business or you aren’t (and the cabs clearly are). Lets get ‘em licensed, but not policed and permitted out of existence. As for the Tourmobile… they make their staff wear polyesther uniforms in the middle of DC summers. Someone should punish them for many, many reasons, but lets start with that. TourMobile has an exclusive contract to do what they do: tour bus with interpretative information from tour guides. Their contact probably says that no one can compete with their exclusive right on the Mall and that the NPS will protect their exclusive right. Are automobile taxi cabs allowed to pick up fares on Madison and Jefferson? Do Metro busses make stops on the Mall? If they do, pediCABS should be able too as well. Taxis and MetroBus don’t provide tours, they provide transportation. 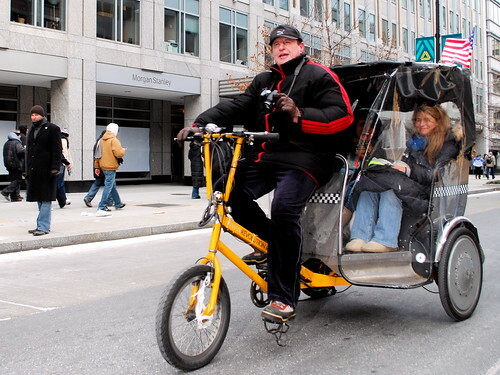 Pedicabs are transportation, not tour guides. Doesn’t matter how they get paid. Now if the pedicab drivers pitch their service as something that’s going to include a tour guide script, then they’re in trouble because that is a tour and that does compete with TourMobile. Beyond this though, TourMobile are wankers all around. Always have, always will. Any updates on this situation??? I definetly agree with comment 8. Pedicabs go around parked cars and buses. They don’t clog space near the mall. Another point, I rarely see automobile taxis taking rides on Madison and Jefferson. And if they do, they’re basically providing a basic service, i.e. a long ride back to the tourist’s hotel in Virginia vs. a short entertaining ride from one museum to another.